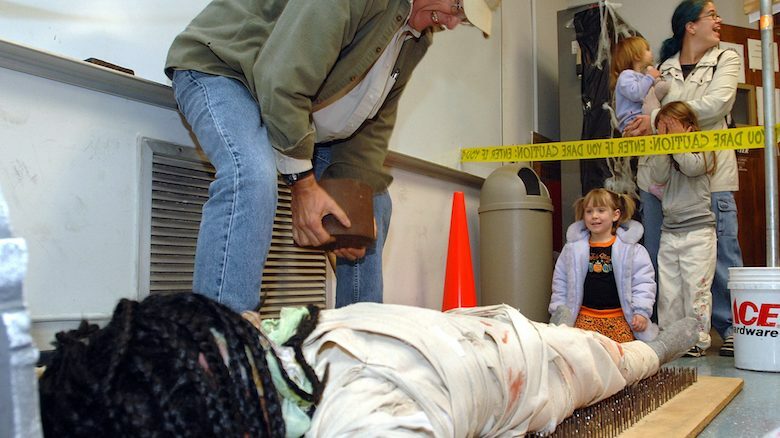 New frights and fresh takes on old delights are the order of the evening when the University of Mississippi Department of Physics and Astronomy presents “Spooky Physics Demonstrations” from 7 to 9 p.m. Oct. 26 in Lewis Hall. The program will include a stage show at 7:30 p.m. New demonstrations planned include a virtual reality simulation that will allow people to see a particle detector in 3D. New demonstrations on electricity, magnetism, lasers and optics also will be on hand. Activities throughout the evening include freezing objects in liquid nitrogen (at minus 320 degrees), generating sound waves with Bunsen burners and tubes, and levitating magnets with superconductors. Other fun hands-on experiences include optical illusions with mirrors, a Van de Graaff generator (a “hair-raising” electrical device), a bed of nails and other contraptions. Physics department personnel also will prepare ice cream with liquid nitrogen and award prizes for the most original, scariest and cutest costumes to kids 10 and under. The annual event is the department’s way to give something back to the community, said Luca Bombelli, chair and professor of physics and astronomy. “We, as scientists, feel that outreach and education is an important part of our work,” he said. “Many people are often intimidated by science, and children often do not pursue a career in STEM because they have not been exposed to it. Parking will be available along All American Drive, in the Circle, areas alongside or behind the Turner Center and the Intensive English building (just west of the Turner Center), in the Pavilion garage or in the Tad Smith Coliseum parking lot after 6 p.m.
For more information or for assistance related to a disability, call the Department of Physics and Astronomy at 662-915-5325.